Madrid: a city founded on tradition and innovation, a city that blends cultures, and a paradise for event planners. Whether you’re thinking of organising an incentive, a conference or a convention or any other form or MICE event, Madrid is a perfect setting for all your campaigns and events. An event planner in Spain like Es.cultura Events couldn’t not be present in a city as inspiring as Madrid. That’s why we set up one of our three offices in the heart of the capital to organise our productions in the buzzing city. If you are looking for an event planner in Madrid, you’ve come to the right place! Read on to discover the opportunities that await for your events in Madrid, and to find out some of the productions that we plan in the city and in its surrounding areas. Spain is one of the most popular destinations in the world for business events, and Madrid is one of the country’s most important hubs for MICE tourism and events in Spain. The capital owes its popularity in the MICE industry to a number of factors. Including (but not limited to): its great circuit of hotels and accommodation, impressive infrastructure and venues. And also a great national and international connections or a rich history and culture. 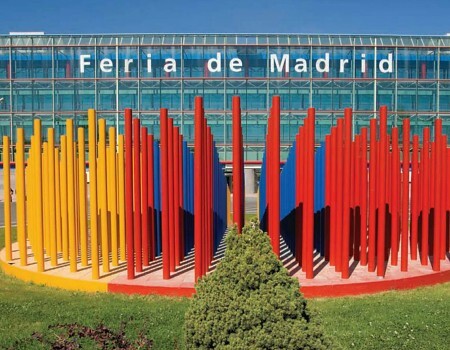 Madrid counts many venues for all types of events, the most prominent of which is the prestigious IFEMA (pictured right), the primary venue for conferences and conventions in the capital. The venue occupies over 200,000m2, counts over twelve halls. Welcoming over 80 trade shows alone every year as well as countless other types of national and international MICE events. The result of this is an economic impact of approximately 816 million euros for the city of Madrid each year. As an event planner, we make use of every opportunity that Madrid has to offer to organise our unique productions. We love to offer unforgettable experiences. Those that leave a positive and lasting memory of the cities where we plan our events. One of our latest productions in Madrid was a themed event based on the annual San Isidro festivities that take place in the capital. We really pushed the boundaries for this event. And chose the fantastic Negralejo Palace on the outskirts of the city to host our production. Participants enjoyed a variety of activities and games such as darts, table football, basket shot competitions, etc. – all in a specially decorated setting with typical dresses for the occasion. Just one of the many events (Zarzuela Route or Team Building Historical Gymkhana) that we plan in Madrid for our clients’ incentive travel to Spain. If you’re looking for an event planner in Madrid to organise your client’s team building activities, then you’ve come to the right place! We have been organising team building events in Madrid for a number of years. Companies are becoming more and more aware of the benefits of team building activities. We have an arsenal of activities for team building in Madrid, including our favourite team building survival event in the natural park of Alcalá de Henares, just outside the city (pictured left). We have also helped plan a number of business meetings and seminars in unique locations such as the Museo del Ferrocarril (railway museum) and other cultural places as requested by our clients and by DMC in Madrid. For more information on our productions, please contact us. Nowadays, brands and businesses are dedicating more and more time and attention to generating emotions. We all need to think a little less about the products or services that we offer. And focus on the needs of the client instead. At Es.cultura Events, we focus all our attention on creating unique and unforgettable experiences for our clients or those of our partner agencies and DMC in Spain. Over the past 20 years, we’ve been planning 100% customised productions that always respond to the clients’ preferences and requirements. This is the core of Es.cultura’s philosophy. We bring to life all your ideas, from the drawing board to the streets. The options are infinite: are you ready to choose Es.cultura Events as your event planner in Madrid. And live an authentic adventure in the capital? Contact us for more information on the production services we offer in Madrid and in the rest of Spain. We are also able to help plan your travel and events in Spain. For further information on the events that we offer, you can also read our lists of activities for team building in Spain, team building in Barcelona, team building in Malaga, and team building in Valencia.